Ursula Vernon is the author of the excellent, comic hybrid Dragonbreath series (Book 11 comes out January, 2016!) 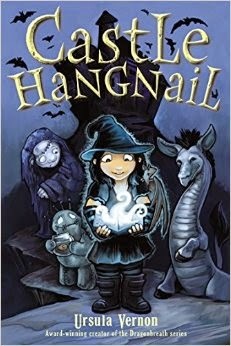 and the superb stand alone novel, Castle Hangnail. Vernon is a triple threat when it comes to kid's books. She is a great illustrator who makes creepy cute on every page. She is an imaginative author, always adding to the fantasy genre. And, best of all, she is a very funny writer. Vernon's new series, Hamster Princess (which is currently my favorite read of 2015) is a perfect example of her talents at play that turns the fairy tale of Sleeping Beauty on its head. In an interview Vernon said she felt that the Sleeping Beauty fairy tale needed a new angle because it, "takes the cake for absolutely nothing going on for the female protagonist. I've seen arguments that the heroes are the fairy god mothers, but I wanted to do something with the story and something about the joke of the spinning wheel and the hamster wheel appealed to me. I thought it would be cute to see." And it is. 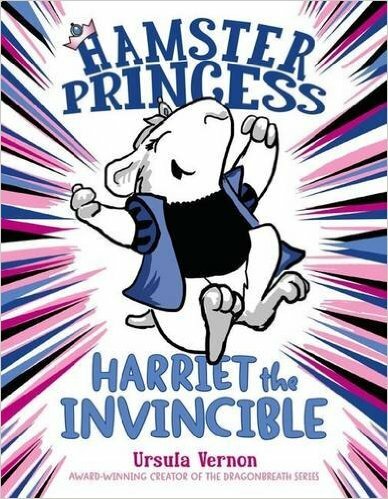 The first book in the series, Harriet the Invincible, had me smiling and laughing from start to finish. The first chapters follow the fairy tale closely, with winged mice standing in for the fairy godmothers and a fierce, red-eyed rat named Ratshade who "traded her tail for power when she was young," which is quite shocking, as the narrator tells us in an aside. Of course the king and queen do everything they can to protect Harriet and prepare for the inevitable when she will prick her "finger upon a hamster wheel and fall into a sleep like death" on her twelfth birthday. 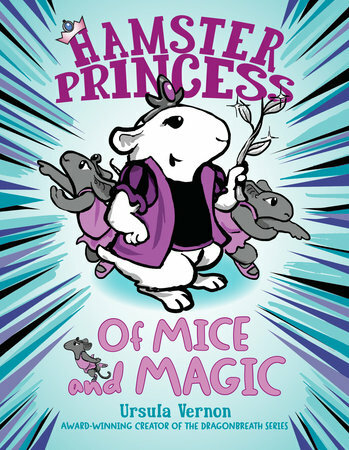 Harriet Hamsterbone is the kind of princess who is "brave and intelligent and excelled in traditional hamster princess skills, like checkers and fractions." She is less interested in developing other traditional princess skills like "trailing around the palace looking ethereal and sighing a lot." When the king and queen tell Harriet about the curse as she nears her tenth birthday, she immediately finds the loophole in this seemingly airtight curse, exclaiming, "Until I'm twelve, nothing can touch me! The curse needs me alive until I'm twelve, or it can't operate. I'M INVINCIBLE!" A brilliant page turn reveals Harriet's first act after making this discovery. We see a tall castle tower with a tiny figure diving down toward the moat shouting, "WHEEEEEEEEE!" Harriet hops on Mumfrey, her battle quail (what else would hamsters ride on?) and heads out into the kingdom to fight ogres, joust and dive off the Cliffs of Perdition. When the Queen enlists the drippy, chauvinistic Prince Cecil to kiss the princess once the spell is in play, Harriet takes matters into her own hands, causing the curse to get twisted, leaving everyone in the kingdom (all 117) needing wake-up kisses. Harriet turns to the Crone of the Blighted Waste for help. Unlike what her name seems to imply, the Crone is a motherly guinea pig and the Blighted Waste has been turned into affordable senior housing. I could go on telling you every humorous detail and hilarious line spoken in Harriet the Invincible, but you should really read the book rather than my review. Vernon promises to play with other fairy tales - in fact, she incorporates the Glass Mountain into Harriet the Invincible - over the course of the Hamster Princess series. Book 2, Of Mice and Magic, (March, 2016) takes on the tale of the 12 Dancing Princesses! 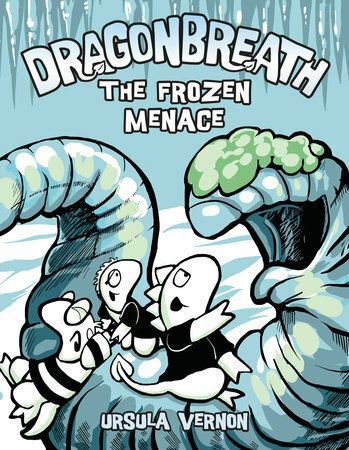 The Frozen Menace, Dragonbreath 11!